Despite giving an underwhelming performance against Colombia in the Round of 16 on Monday, the United States managed to squeak out a 2-0 victory over the South Americans to advance to the quarterfinal match against China on Friday. The Chinese women fought their way through a relatively tough group of Canada, New Zealand and the Dutch and managed to eek out a 1-0 victory over Cameroon to set up this match against the US. In their previous 20+ meetings, the US have never lost to the Chinese, but the World Cup provides the opportunity for plenty of upsets. 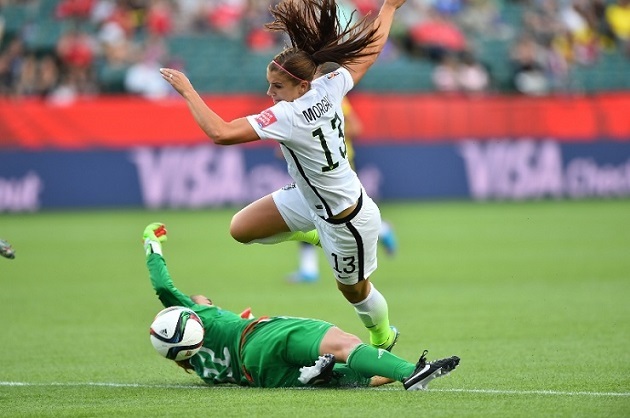 The major concern for the US this tournament continued even after Monday’s 2-0 victory. Despite having a man advantage for essentially the entire second half, the United States still looked anything but convincing in the attacking third. Granted, Alex Morgan finally got on the score sheet thanks to the Colombian goalkeeper cheating off her line, but fans would’ve still expected players like Megan Rapinoe and Abby Wambach to create more chances against a weaker defense. Wambach nearly put the US up immediately after the yellow card from the penalty spot, but her spot kick narrowly missed the net. As the USWNT progessesses further and further into the tournament, they’re going to need more consistent performances from their frontline if they hope to fight for the cup and the game against China provides the perfect opportunity to spark a good run of form. Another issue facing the Stars and Stripes going into the quarterfinals will be the absences of Megan Rapinoe and Lauren Holliday through suspension. Rapinoe and Holliday have started every game of this year’s tournament for the United States, and have helped to provide a large chunk of the offensive chances the team have had. Rapinoe, in particular, currently leads the team in goals with two (both coming against Australia in the opening match), and has been the only US player to provide a consistent creative flair throughout the tournament. The loss of both of these key players will provide Jill Ellis with quite the problem when it comes to selecting Friday’s squad. For a team ranked 16th in the world to fight all the way to the quarterfinals is an accomplishment in itself. China will now be looking to play David to the United States’ Goliath Friday in Ottawa. Through the group stage, China went 1-1-1, with their sole victory coming over a 12th-ranked Dutch team. In their one match against a top ten squad, the Chinese women fell 1-0 to the host nation Canada. In that match, however, China was able to play right with the Canadians and nearly stole a point from the match only to lose it with a late penalty kick. This result against Canada shows that the Chinese can compete with the world’s best when they play up to their potential, but the added pressure of an elimination game could cause the team to crack. So far in this World Cup, only two women have managed to find the back of the net for China. All four goals the team have scored through their first four matches have been evenly split between Wang Lsi and Wang Shanshan. The lack of depth when it comes to a Chinese goalscorer could be their ultimate downfall. The US backline hasn’t given up a goal since their opening match, and if they can shut down Lsi and Shanshan China doesn’t have any other proven goal scorers on their roster. Per my usual trend this tournament, I think that the United States will win this match. It’s only a matter of time before the team starts to click offensively, and even when they haven’t played their best matches they’ve still gone through undefeated in the tournament. Final score will read US 3-0 China.